Box Text: Looking for a baseball game that will challenge your skills and tickle your funnybone? You've finally found it. 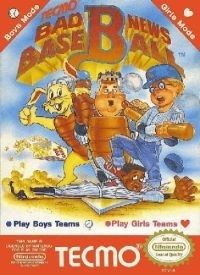 Bad News Baseball is the new cartoon-style, outrageously funny baseball game only from Tecmo. It's fast-paced and jam-packed full of new animated cinema displays and exciting action. And now, Bad News Baseball has boys and girls teams! Play against the computer, play with a buddy, or use the spectator mode, but you had better get ready to laugh. Featuring 12 boys teams and 12 girls teams, 11 different pitches and Tecmo's famous instant close-ups, all you need is a hotdog and you're ready to play! 12-17-2013 pacpix Box Text Looking for a baseball game that will challenge your skills and tickle your funnybone? You've finally found it. 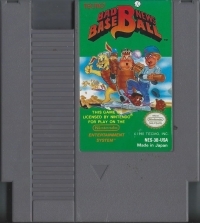 Bad News Baseball is the new cartoon-style, outrageously funny baseball game only from Tecmo. It's fast-paced and jam-packed full of new animated cinema displays and exciting action. And now, Bad News Baseball has boys and girls teams! Play against the computer, play with a buddy, or use the spectator mode, but you had better get ready to laugh. 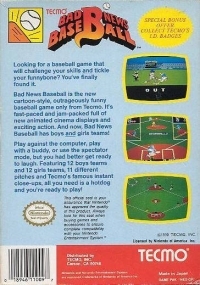 Featuring 12 boys teams and 12 girls teams, 11 different pitches and Tecmo's famous instant close-ups, all you need is a hotdog and you're ready to play! This is a list of VGCollect users who have Bad News Baseball in their Collection. This is a list of VGCollect users who have Bad News Baseball in their Sell List. This is a list of VGCollect users who have Bad News Baseball in their Wish List.